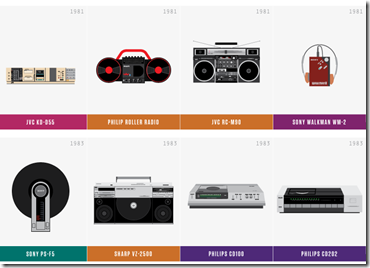 PopChartLab created this compendium of audio recording and playing devices over time. It’s pretty comprehensive. However, I think PopChartLab is on the verge of becoming the Buzzfeed of infocharts: pointless compiled lists of cartoonized objects. Cocktail Chart of Film and Literature?!? Fictional Beers?!? Nebula of NES Games?! Shark jumped. Going back to the original topic: am I the only who occasionally calls his iPod a “walkman”?